Background: Single port surgery and transumbilical surgery are progressing rapidly. The advantages of the cosmetic appearance of this surgery encourages the surgeon to do it which has good acceptance from the patients. Moreover transumbilical laparoscopic cholecystectomy has the miratus of the single port surgery and traditional laparoscopic surgery. Single port surgery seemed to be expensive more than traditional laparoscopic surgery. Transumbilical Laparoscopic surgery is a rapidly evolving field as a bridge between traditional laparoscopic surgery and natural orifice transluminal endoscopic surgery (NOTES). Aim: Hereby, we report of the initial clinical experiences in Saudi Arabia with this new technique. Ten cases of gallbladder stone are selected for this new technique. Materials and Methods: Tow curved intra-umbilical incision was made with 5mm port for camera (30 degree angle) and 8mm working port. Two separate incision 2mm each at right upper quadrant. Dissection was performed using an electric cautery hook and an endograsper. Result: Nine out of ten procedures were completed successfully and one case converted to conventional laparoscopic cholecystectomy because acutely inflamed. Average operative time 48 min with minimal blood loss. Postoperative follow-up did not reveal any umbilical wound complication. Conclusion: Therefore, transumbilical laparoscopic cholecystectomy is feasible and a promising alternative method as less scar in abdominal surgery for the treatment of some patients with gallbladder stone. No extra cost or special instruments are used. Moreover, we reduce the risk of the post single port hernia surgery. Since the introduction of laparoscopic cholecystectomy as the gold standard procedure to remove the gallbladder, many surgeons have attempted to reduce the number and size ports in laparoscopic cholecystectomy to decrease parietal trauma and improve cosmetic results.,, These efforts are some of the fundamentals of the natural orifice transluminal endoscopic surgery (NOTES); the recent focus has been on the development of single-incision laparoscopic surgery (SILS) to further minimize the invasiveness of laparoscopic surgery by reducing the number of incisions. SILS was described as early as 1992 by Pelosi and Pelosi, who performed a single-puncture laparoscopic appendectomy, and in 1997. The real challenge of SILS is to avoid conflict between the operative instruments and the camera, to maintain the pneumoperitoneum, and reduce operative stress. As a result of the limited space with using only a single incision, it is difficult for both the surgeon and the assistant to work in the area. Additional scarless laparoscopic cholecystectomy is reported.,,, The Medical City of King Saud University is the Center of Laparoscopic since 1991. We extend previous work., Transumbilical laparoscopic cholecystectomy may offer the advantages of reducing postoperative pain and virtually scarless surgery, easy technique, and low cost as compared to SILS. Here we report our initial experience with ten patients who underwent transumbilical laparoscopic cholecystectomy, and review of literature, as an alternative to single port surgery. Ten cases of gallbladder disease were selected for this new technique from the past 6 months of 2009. Indications included chronic cholecystitis and symptomatic gallbladder stone. Average operative time was 48 min with minimal blood loss. Five millimeters incision made at skin of umbilical cleft then Veress used for pneumoperitoneum and maintained at 12 mm and 5 mm camera inserted through 5 mm port. Separate 8 mm skin incision made at umbilical cleft and 8 mm port inserted. 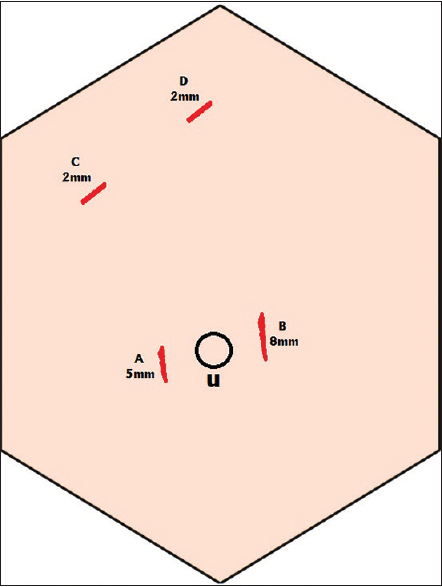 Two incisions made at the right upper quadrant 2 mm each [Figure 1]. The patient was put in an anti- Trendelenburg position and rotated to the left, as in standard laparoscopic cholecystectomy and surgeon stand in between patient's legs. Two stay sutures applied, one to Hartman's pouch and the other to the fundus with the help of 2 mm endograsper used in pediatric laparoscopy. Traction at fundus and Hartman's pouch was done with 2 mm endograsper handling stay suture rather than the tissue. Dissection was performed as a normal retrograde cholecystectomy using an electric cautery hook in the 8 mm trocar and a 2 mm endograsper in the other trocar. The cystic artery and duct were first exposed, then separately clipped with a standard 5 mm clip applier and excised. The gallbladder was extracted though the 8 mm umbilical port. Careful control of homeostasis was achieved. Finally, the 8 mm trocar fascia only was closed with an absorbable suture. Patients received food orally when fully awake postoperative day. Postoperative follow-up did not reveal any hernia and good cosmoses in 6 months. The procedure was done as day surgery. Laparoscopic surgery is a well-established alternative to open surgery across disciplines. Although the magnitude of impact varies by procedure, generally the benefits of laparoscopy on postoperative pain, cosmetics, hospital stay, and convalescence are recognized widely.,, Many surgeons have attempted to reduce the number and size of ports in laparoscopic surgery to decrease parietal trauma and improve cosmetic results, and recently two innovations have been developed: NOTES, which removes transabdominal incisions completely and SILS, which completes laparoscopic procedures by trocars located at one umbilical incision., Because NOTES is technically challenging and SILS needs instrumental improvement and challenge of SILS because of conflict between the operative instruments and the camera to maintain the pneumoperitoneum and risk of bowel injury from capacitance effect due to crossing between cautery and other instrument, transumbilical laparoscopic cholecystectomy is promising alternative.,, In literature review, Hu et al. randomized 32 patients to single-port technique (ST) and two trocar technique (TT) with 2 mm port at right upper quadrant (RUQ); study showed the mean operative time as significantly shorter with the TT technique (35.71 ± 9.74 min) than with the ST technique (125.25 ± 18.9 min (9 < 0.001). Use of analgesics after surgery also was less in the TT group than in the ST group (0 vs. 7, respectively, P < 0.05). The postoperative hospital stay did not differ significantly between the two groups (P > 0.05). Cuest et al. reported that 10 female patients underwent transumbilical scarless laparoscopic cholecystectomy. Through the umbilicus, two trocars of 5 mm were introduced parallel to another with a bridge of fascia between them. Mean operative time was 70 min (range: 65–85) with no conversions and hospital stay was <24 h with no complications., Gerdes et al. reported two cases with combined suprapubic and transumbilical approach. A 30 camera was inserted through a 5 mm intraumbilical trocar. A 10 mm trocar was inserted through a suprapubic incision. The gallbladder was fixed to the abdominal wall by a suture. The fundus was manipulated by a 5 mm grasper introduced through the suprapubic access alongside the camera trocar in one patient and by a 2 mm grasper in the second patient. This report documents the feasibility of transumbilical laparoscopic cholecystectomy. The clinical advantages of this approach may eventually require a randomized controlled trial to compare it with conventional laparoscopic cholecystectomy and SILS. The major advantage of this method is improved cosmetics with virtually scarless surgery, easy to convert to conventional laparoscopic cholecystectomy, easy technique, no need for special instruments, and low cost as compare to SILS. All procedures were completed successfully within a reasonable time. Moreover, the risk of port hernia is less. On the other hand, we use 2 mm instrument to manipulate the gallbladder giving big laparoscopic field with small wounds. Further advantages of transumbilical laparoscopic cholecystectomy compared to conventional laparoscopic cholecystectomy will ultimately require a clinical trial. In SILS, the needs of flexible laparoscopic and disposable single port as SILS port (Covidien Inc., Norwalk, CTUSA) or Triport (Advanced Surgical Concepts Bray Cp distributed by Olympus, Wicklaw, Ireland). In contrast, our technique uses regular instrument without additional cost. In extending the previous work,, we documented the feasibility of transumbilical laparoscopic cholecystectomy. This procedure is a promising alternative method, with scarless abdominal surgery, for the treatment of patients with gallbladder stone. The editors would like to acknowledge the help of all the people involved in this journal and, more specifically, to the editors and authors of this manuscript, to Charmaine Manalo, who retyped, submit, and coordinate and to the reviewers that took part in the review process. Without their support, this publication would not have become a reality. The editorial board would like to thank each one of the authors for their contributions. Our sincere gratitude goes to the chapter's authors who contributed their time and expertise to this manuscript. We wish to acknowledge the valuable contributions of the reviewers regarding the improvement of quality, coherence, and content presentation of chapters. Asakuma M, Perretta S, Allemann P, Cahill R, Con SA, Solano C, et al. Challenges and lessons learned from NOTES cholecystectomy initial experience: A stepwise approach from the laboratory to clinical application. J Hepatobiliary Pancreat Surg 2009;16:249-54. Bessler M, Stevens PD, Milone L, Parikh M, Fowler D. Transvaginal laparoscopically assisted endoscopic cholecystectomy: A hybrid approach to natural orifice surgery. Gastrointest Endosc 2007;66:1243-5. Reddt N, Rao P. Per Oral Transgastric Endoscopic Appendectomy in Human. Abstract Rpresented at 45th Annual Conference of the Society of Gastrointestinal Endoscopy of India. Jaipur, India; 28-29 February, 2004. Marescaux J, Dallemagne B, Perretta S, Wattiez A, Mutter D, Coumaros D, et al. Surgery without scars: Report of transluminal cholecystectomy in a human being. Arch Surg 2007;142:823-6. Pelosi MA, Pelosi MA 3rd. Laparoscopic appendectomy using a single umbilical puncture (minilaparoscopy). J Reprod Med 1992;37:588-94. Hirano Y, Watanabe T, Uchida T, Yoshida S, Tawaraya K, Kato H, et al. Single-incision laparoscopic cholecystectomy: Single institution experience and literature review. World J Gastroenterol 2010;16:270-4. Hu H, Zhu J, Wang W, Huang A. Optimized transumbilical endoscopic cholecystectomy: A randomized comparison of two procedures. Surg Endosc 2010;24:1080-4. Cuesta MA, Berends F, Veenhof AA. The “invisible cholecystectomy”: A transumbilical laparoscopic operation without a scar. Surg Endosc 2008;22:1211-3. Gerdes B, Gitei E, Akkermann O, Prasse-Badde J, Schmidt C. Laparoscopic cholecystectomy without visible scar. Combined suprapubic and transumbilical approach: The “Minden cholecystectomy”. Endoscopy 2009;41 Suppl 2:E49-50. Tyagi S, Sinha R, Tyagi A. Single incision laparoscopic cholecystectomy: Less scra, less pain. J Minim Acess Surg 2017;13:118-23. Aldohayan A, Alshomer F, Alnaami M, Alobeed O, Bamehriz F. Laparoscopic port cleaning: A technique for better visualization. Saudi J Laparosc 2016;1:17-9. Aldohayan A, Alshomer F, Al-naami M, Al-Obeed O, Bamehriz F, Tarakji AR. Laparoscopic oviductal fimbrioplasty for peritoneal dialysis catheter outflow obstruction caused by ovarian fimbraie. Saudi J Laparosc 2016;1:20-2. Zubaidi AM. Single port laparoscopic cholecystectomy: Scarless cholecystectomy. Minim Invasive Surg 2012;2012:5 [doi: 10.1155/2012/204380].